Available in Single Element Configuration Only. The M8M series of small diameter thermocouple probes with M8 connectors can be used where other sensors can't. Their smaller size allows for measurements in tight spaces, or when you need to have a minimal impact on the thermal environment that you are measuring. These thermocouple sensors are available in Type J with 304 stainless steel sheaths, or in Type K with Inconel 600 sheaths. The 1/8" diameter version is overmolded in the ANSI color code and is available in 6", 9" and 12" lengths. The 2 mm and 3 mm diameter versions are molded in the IEC color code and is available in 150, 200 and 250 mm lengths. The connector pin out is as shown in the accompanying figure. To maintain the proper polarity and the use of thermocouple materials from the sensor to your measurement or control instrument, we recommend one of Omega's M8 Thermocouple Extension Cables (listed in the ordering table below). 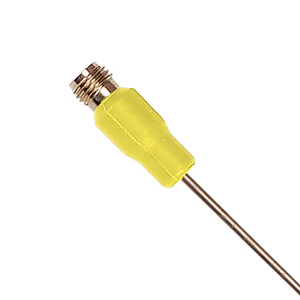 Type K Thermocouples have an Inconel 600 sheath with a temperature range of -40 to 1150°C, with the connector overmolded in yellow nylon on the 1/8" diameter version, and green nylon on the 2mm and 3mm diameter versions. Note: Molded connectors have a maximum temperature of 90°C. Fractional sizes are available with 1/8" diameter x 6", 9" or 12" long probes. Metric sizes are available with 2mm or 3mm diameter x 150, 200 or 250mm long probes. Insulation Resistance is 100 megohms at 100VDC for ungrounded sensors. Minimum Bend Radius is three times the outer probe diameter. Connect your M8 thermocouple probe to one of Omega's wide variety of in-stock controllers, data loggers, hand held thermometers, PLCs or other measurement or process control products to complete your measurement or control system. Type J Ungrounded Thermocouple with 304 Stainless Steel Sheath, 1/8' Diameter by 6' Long Probe with Molded M8 Connector. Type J Ungrounded Thermocouple with 304 Stainless Steel Sheath, 1/8' Diameter by 9' Long Probe with Molded M8 Connector. Type J Ungrounded Thermocouple with 304 Stainless Steel Sheath, 1/8' Diameter by 12' Long Probe with Molded M8 Connector. Type K Ungrounded Thermocouple with Inconel 600 Sheath, 1/8' Diameter by 6' Long Probe with Molded M8 Connector. Type K Ungrounded Thermocouple with Inconel 600 Sheath, 1/8' Diameter by 9' Long Probe with Molded M8 Connector. Type K Ungrounded Thermocouple with Inconel 600 Sheath, 1/8' Diameter by 12' Long Probe with Molded M8 Connector. Type J Ungrounded Thermocouple with 304 Stainless Steel Sheath, 2mm Diameter by 150mm Long Probe with Molded M8 Connector. Type J Ungrounded Thermocouple with 304 Stainless Steel Sheath, 2mm Diameter by 200mm Long Probe with Molded M8 Connector. Type J Ungrounded Thermocouple with 304 Stainless Steel Sheath, 3mm Diameter by 150mm Long Probe with Molded M8 Connector. Type J Ungrounded Thermocouple with 304 Stainless Steel Sheath, 3mm Diameter by 200mm Long Probe with Molded M8 Connector. Type J Ungrounded Thermocouple with 304 Stainless Steel Sheath, 3mm Diameter by 250mm Long Probe with Molded M8 Connector. Type K Ungrounded Thermocouple with Inconel 600 Sheath, 2mm Diameter by 150mm Long Probe with Molded M8 Connector. Type K Ungrounded Thermocouple with Inconel 600 Sheath, 2mm Diameter by 200mm Long Probe with Molded M8 Connector. Type K Ungrounded Thermocouple with Inconel 600 Sheath, 2mm Diameter by 250mm Long Probe with Molded M8 Connector. Type K Ungrounded Thermocouple with Inconel 600 Sheath, 3mm Diameter by 150mm Long Probe with Molded M8 Connector. Note: For non-standard lengths shorter than 250mm or 12 inches, change the length in the model number to the required length (in millimeters or inches as applicable) and use the price of the next longest standard length.